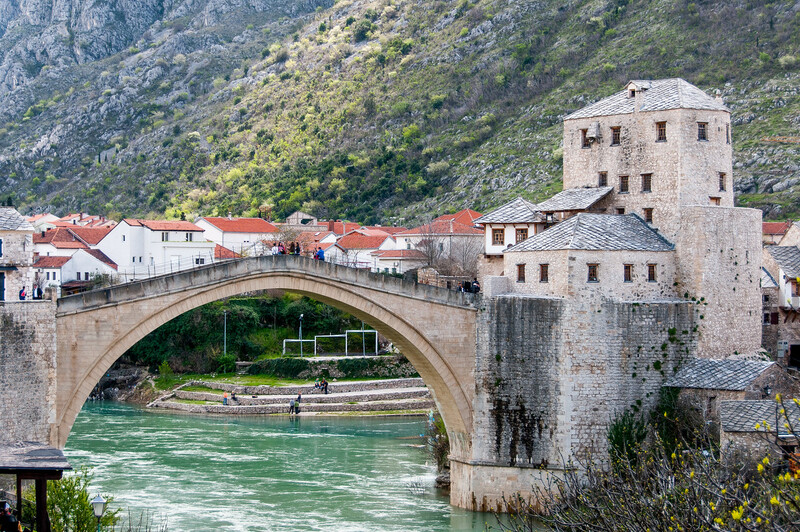 The Old Bridge area of the Old City of Mostar, with its exceptional multicultural (pre-Ottoman, eastern Ottoman, Mediterranean and western European) architectural features, and satisfactory interrelationship with the landscape, is an outstanding example of a multicultural urban settlement. The qualities of the site’s construction, after the extremely ravaging war damage and the subsequent works of renewal, have been confirmed by detailed scientific investigations. These have provided proof of exceptionally high technical refinement in the skill and quality of the ancient constructions, particularly of the Old Bridge. Of special significance is the Radoboija stream, which enters the Neretva on its right bank. This provided a source of water for the growing settlement, and from it springs a number of small canals used for irrigation and for driving the wheels of water-mills. There has been a human settlement on the Neretva between the Hum Hill and the Velez Mountain since prehistory, as witnessed by discoveries of fortified enceintes and cemeteries. Evidence of Roman occupation comes from beneath the present town. Little is known of Mostar in the medieval period, although the Christian basilicas of late antiquity continued in use. The name of Mostar is first mentioned in a document of 1474, taking its name from the bridge-keepers (mostari ); this refers to the existence of a wooden bridge from the market town on the left bank of the river which was used by soldiers, traders, and other travellers. At this time it was the seat of a kadiluk (district with a regional judge). Because it was on the trade route between the Adriatic and the mineral-rich regions of central Bosnia, the settlement spread to the right bank of the river. It became the leading town in the Sanjak of Herzegovina and, with the arrival of the Ottoman Turks from the east, the centre of Turkish rule. The town was fortified between 1520 and 1566, and the bridge was rebuilt in stone. The second half of the 16th century and the early decades of the 17th century were the most important period in the development of Mostar. Religious and public buildings were constructed, concentrated on the left bank of the river, in a religious complex. At the same time many private and commercial buildings, organized in distinct quarters, known as mahalas (residential) and the bazaar, were erected. In 1998 UNESCO helped in the recreation of the bridge which was completed in 2004, with the bridge being listed as a World Heritage Site in 2005. The scars from the Bosnian War can still be seen in Mostar. Bullet holes can be seen in many buildings and a few still remain gutted. Although there is peace, the city is still divided between Croats and Muslims, a situation which is unlikely to change anytime soon. I visited Mostar on a day trip from Dubrovnik, which is probably the easiest way to visit the city. There are tours leaving Dubrovnik daily. 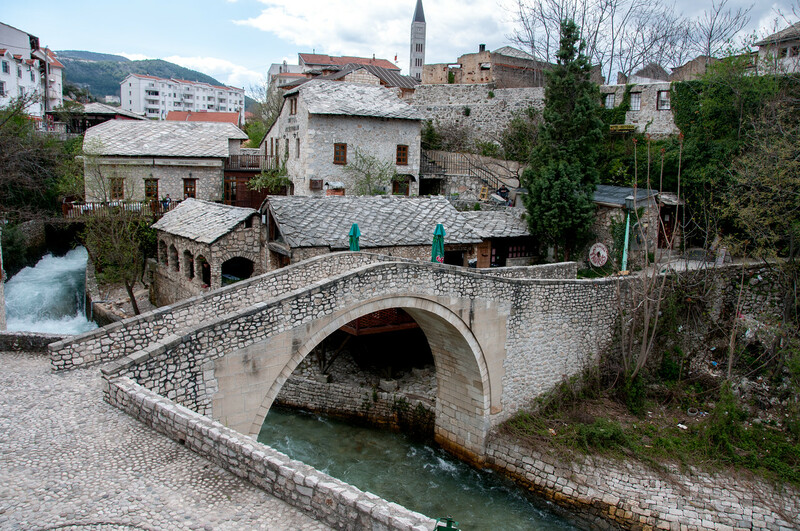 The Old Bridge Area of the Old City of Mostar is cultural UNESCO World Heritage Site in Bosnia and Herzegovina. It was inscribed in 2005 for its post-medieval European and urban landscape that exemplifies the cultural heritage of the region. UNESCO also aimed to preserve and protect the multicultural background of the town that enriched its cultural heritage. 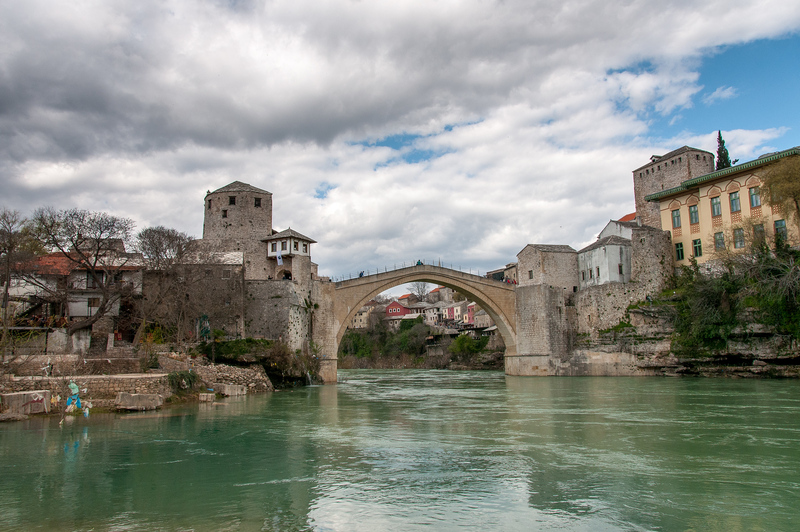 It is also known as Stari Most. 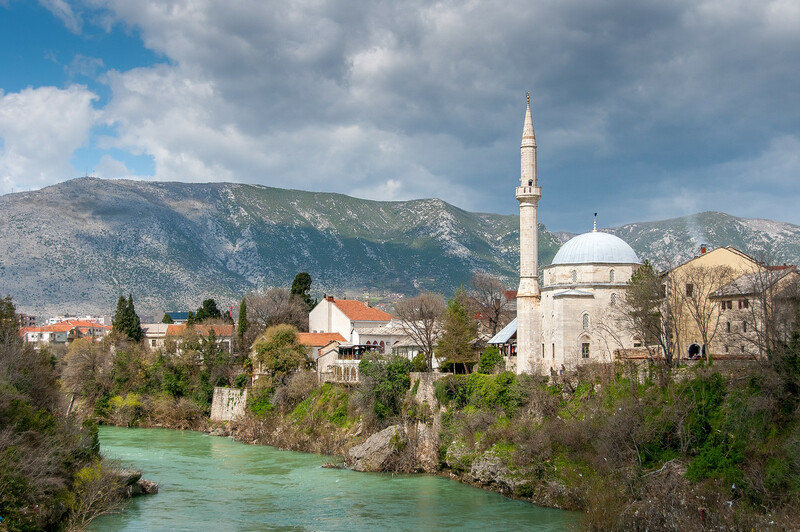 The town that encompasses the Old Bridge Area of the Old City of Mostar developed during the Ottoman period. The height of the town’s development took place during the 16th century. The Old Bridge serves as a landmark of the town and the name of the town was after the bridge keepers. Despite these other Ottoman structures, the Old Bridge Area of the Old City of Mostar is one of the most recognizable landmarks not just in the town of Mostar but also in the entire country. It has been around for 427 years and crosses the Neretva river to connect two parts of the town. It features a humpback architectural style and is 4 meters wide and 30 meters long. The old bridge is protected by two towers: the Halejiba tower and Tara tower. These two towers serve as “the bridge keepers”. The arch of the Old Bridge Area of the Old City of Mostar is made with a local stone called tenelija. The shape of the arch is not intentional but rather due to numerous irregularities caused by a deformation in the inner line of the arch. The bridge isn’t built out of a typical foundation but rather with abutments of limestone. It is linked to the waterside cliffs and is erected at 6.53 meters from the water level. The arch of the bridge rises up to 12 meters in height. In November 1993, during the Croat-Bosniak War, the Old Bridge Area of the Old City of Mostar was destroyed by the Croat military forces. However, once the war was finished, a project was established in order to reconstruct the bridge. By July 2004, it was fully restored and re-opened to the public. It was UNESCO and the World Bank together with the World Monuments Fund and Aga Khan Trust for Culture that funded and oversaw the reconstruction project. 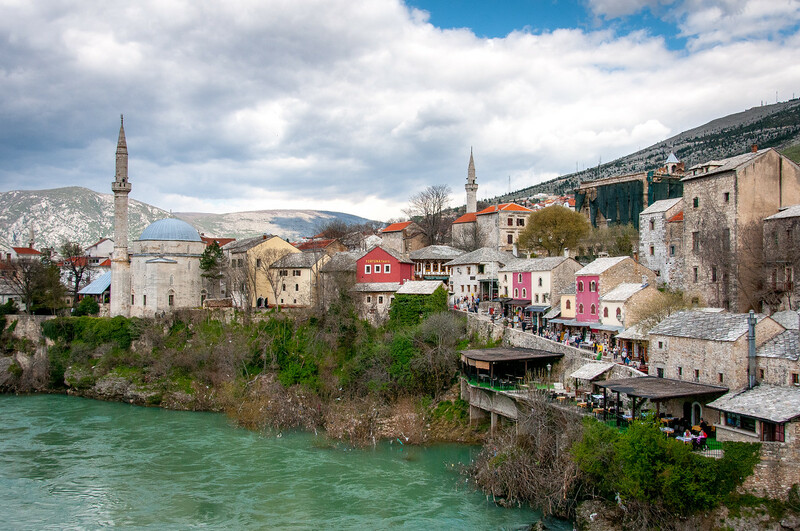 View my complete list of UNESCO World Heritage Sites in Bosnia and Herzegovina.